Out of curiosity I let this really fast growing plant continue growing – even though I was pretty sure it was a bad weed. I was too curious for my own good – perhaps I was a cat in another lifetime. Anyway, this 10 foot tall plant is a giant. Some of the leaves are the size of a dinner plate. 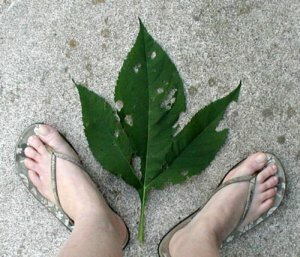 The leaves are not all the same shape, some have one lobe, others have two or three lobes. All leaves are shallowly toothed, hairy, and have pointed tips. This, plus the fact that there is no woody stem, differentiates Giant Ragweed from Sassafras. 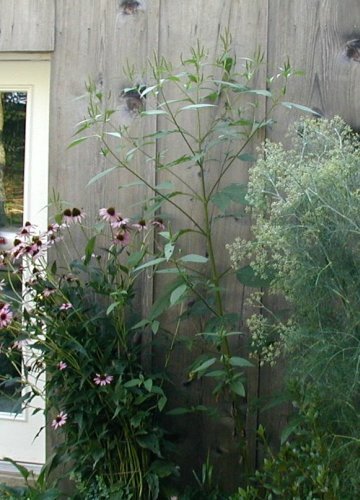 Sandwiched between Echinacea on the left and Fennel on the right, Giant Ragweed grew as tall as the door. 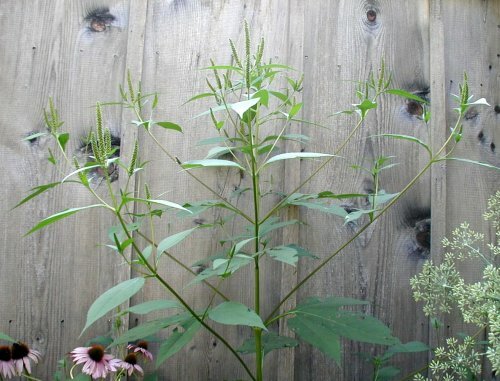 Giant Ragweed reaches over three feet wide and 10 feet tall. Giant Ragweed or Great Ragweed, Ambrosia trifida, is unmistakable once you see its size and those spikes of sneeze-producing, pollen-filled flower heads. 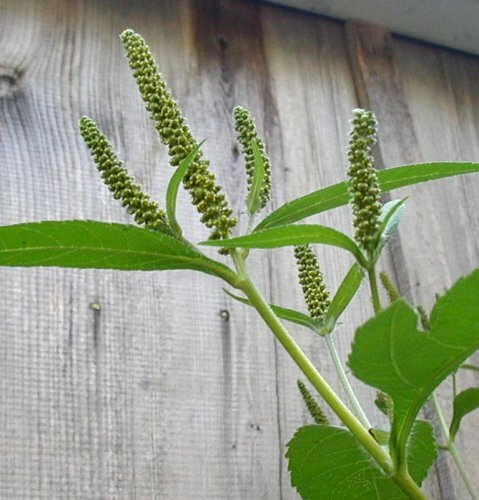 The flower spikes are just like those of the Common Ragweed, Ambrosia artemisiifolia, which grows along roads and in fields and waste places. The flowers are green and its parts are indistinguishable, but the yellow pollen is quite noticeable. Common Ragweed leaves have many lobes and that differentiates it, apart from size, from the giant ragweed. Giant Ragweed has single-, double- or triple-lobed leaves. 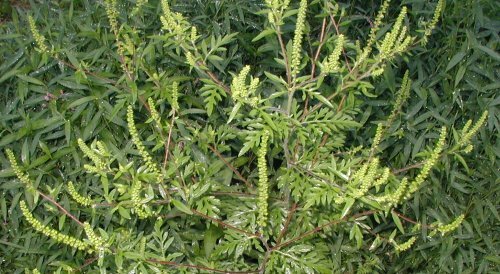 The tri-lobed leaf is the most recognizable as belonging to the Great Ragweed plant. Tri-lobed leaf of Giant Ragweed. So, to be a complete fool, I’ll admit I could have moved the Giant Ragweed before it got to the flowering stage as it was in a pot! Now it’s in the burn pile and since the rain has stopped, it’s toast. As it grew I had this idea that I would be sorry to have let it go for so long. Next year I hope the mint will out compete new seedlings and overtake this area. If I need to pull out seedlings, that key to the broadleaved weeds might come in handy. If it were the Common Ragweed I could just look for the highly dissected leaves having rounded lobe tips. Close up view of Common Ragweed flower spikes. Common Ragweed leaf shape is dissected. We have marigolds in and around the vegetable garden and often find ourselves transplanting the volunteers that pop up from seeds to other areas. 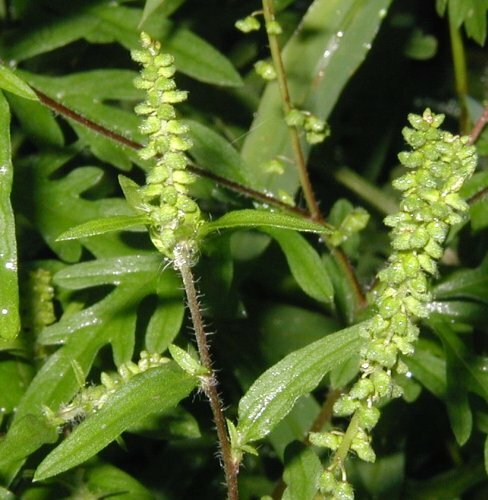 Their seedings look like the seedlings of common ragweed except for the fact that ragweed seedlings have an overall rounded shape to each leaf. Common ragweed seedling or shoot sprouting up in the lawn. Notice the rounded leaf lobes. 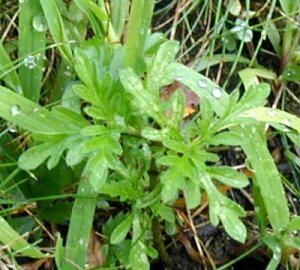 Ragweed seedlings can be distinguished from marigold seedlings by the leaf lobe tip shape. 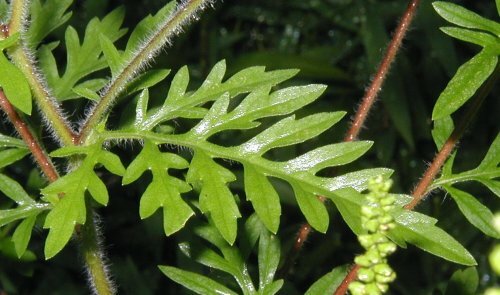 The highly dissected leaves of common ragweed have rounded leaf lobes while marigolds have pointed ones and toothed leaflets. 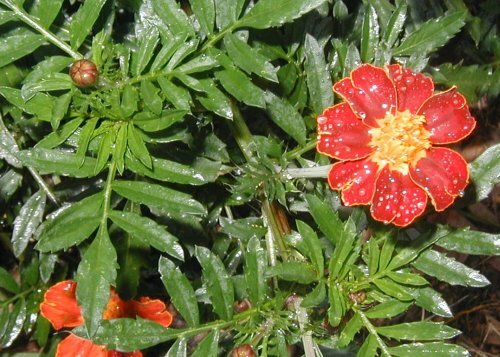 Marigold leaves are dissected, like common ragweed leaves, but marigold leaves are pointed at the tips and slightly toothed.